As you're probably already aware, the black and white trend has been everywhere! From clothes, accessories, handbags to shoes! 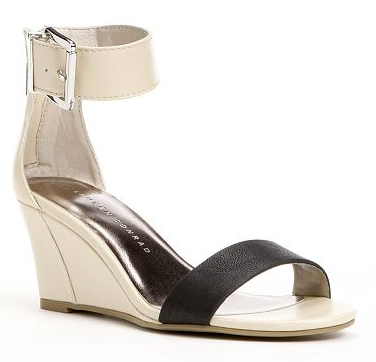 Here's an easy way to incorporate the trend into your wardrobe with these adorable LC Lauren Conrad ankle strap sandals from Kohl's. I love that it's a wedge, for that extra comfort. Pair them up with a skirt or a dress and it's the perfect look for a Sunday brunch. These are so cute! I don't know which I love more - the shoes or LC!